If your organization data is not in a format that Visio can read, and you would like to type it into a spreadsheet but don’t want to start from scratch, the Organization Chart Wizard can create a preformatted spreadsheet for you. In this exercise, you’ll use the Organization Chart Wizard to create an Excel workbook into which you’ll enter your organization data. SET UP Click the File tab, and then click New. Click Categories, click Business, and then double-click the Organization Chart thumbnail. Then follow the steps. On the first page of the Organization Chart Wizard, click Information that I enter using the wizard. The description text for this option confirms that you will be creating a new data source. Click Next. The File Type selection page appears. On the File Type selection page, click Excel, and then click the Browse button. In the resulting dialog box, select a folder in which to save the file, type Org Chart Data via Wizard in the File name box, and then click the Save button. The selected file name appears in the New file name box. Click Next. Visio instructs you to type your data over the sample data provided in the Excel workbook it has created. Click OK. Excel opens to display the formatted workbook. As shown in the following graphic, each column heading includes a comment with instructions for entering data in that column. Ordinarily, you would type your data into the worksheet at this point; however, for this exercise you’ll use the sample data, so just close Excel. Closing the worksheet isn’t sufficient; you must close the Excel application. 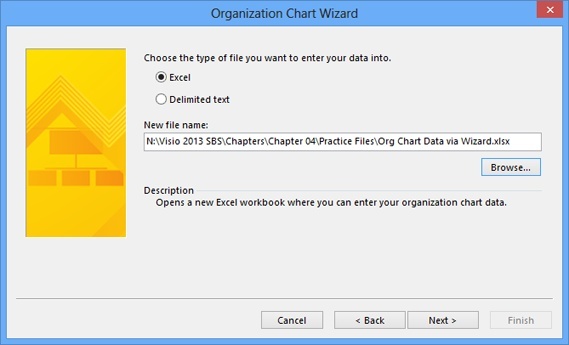 After Excel closes, Windows returns the focus to Visio and the photo import page of the Organization Chart Wizard. Click Next and then click Finish to display your org chart. CLEAN UP Save the sample file if you want to keep it. In the preceding exercise, you created an org chart by typing data into Excel. What if you prefer to start by dragging and dropping shapes, yet you still want to work with an external data source? 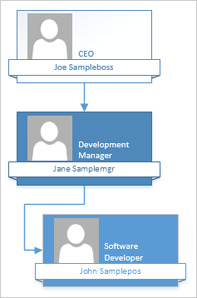 Drag and drop org chart shapes as you did in Building organization charts by hand. Export the data to Excel as you did in the exercise in this section. Add and edit the data in your Excel workbook to fill out your organization’s details. Create a new org chart from the data in Excel as you did in Using the Organization Chart Wizard with existing data.